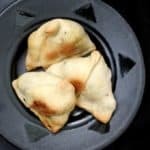 A Baked Samosa that satisfies the urge of sinking your teeth in a flaky samosa without the accompanying calories. In fact, this Baked Samosa has a spicy and healthy filling of chickpeas and potatoes. A soy-free, nut-free, vegan recipe. Place the flour in a bowl, mix in the salt and ajwain, then add to it the butter or coconut oil. With your fingers, crumble the bits of fat into the floor until it is evenly distributed and the flour looks grainy. This will ensure your crust is crisp. Now, adding just a little cold water at a time, knead the flour into a stiff dough. You can do this in a food processor or mixer, but if you do, be sure to not overmoisten your dough and make it too wet. Heat oil in a skillet or wok. Add the mustard seeds and when they sputter, add onions and cilantro and saute until the onions just start to brown, about 4-5 minutes on medium heat. Add the ginger-garlic paste and the green chili peppers. Saute for another minute without letting the garlic burn. Add the chickpeas and potatoes with the garam masala and chaat masala or lime juice. Add salt. Stir well to mix together. Allow the stuffing to cook without covering the skillet until any moisture has evaporated. Season with salt. Break off a ball of the dough about an inch in diameter and roll it into a ball between the palms of your hands. Now roll in a single direction to make an oval. With a knife or a pastry-cutter, cut into two so you have two semi-circles. Smear water along the edges of each semi-circle. Now bring the edges together to form a cone. Press with your fingers to seal the edge. Place 1 1/2 tbsp of filling into the cone, stopping short of filling all the way to the top. With your fingers, push together the top of the cone, making a little pleat in the back if necessary. Seal tight, pressing along the edges, so nothing stumbles out during baking. Prepare the rest of the samosas the same way. Place them on a baking sheet sprayed with oil or cooking spray. Make the wash by mixing the oil and the nondairy mik. Brush the tops of the samosas lightly with this mixture. Bake in a preheated 350-degree oven for 40 minutes or until the edges of the samosas are golden-brown. Flip the samosas once halfway through baking and coat the other side with the wash before returning to the oven. Once the samosas are out of the oven, let them stand five minutes before serving with date-tamarind chutney.